Self contained cartridges have four components. A brass case grips the bullet at the case neck and is sometimes crimped into a groove in the bullet to keep it from shifting under the forces of recoil. The volume available for powder inside the case, the maximum pressure allowed for the cartridge, and the diameter of the base of the bullet all help determine the power of the cartridge. To ignite the charge, a small metal cup of impact sensitive chemicals, called a primer, is seated recessed in the primer pocket of the brass case just behind the flash hole leading to the main charge. The protected primer of this cartridge needs to be center struck by the gun's firing pin and is referred to as a centerfire. 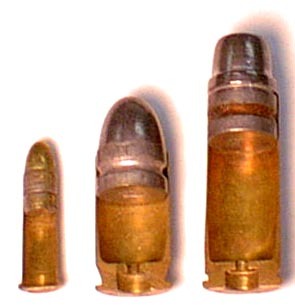 The brass case can be squeezed back to the right size, a fresh primer can be installed, and a new bullet can be crimped over a measured powder charge. The .22 shown on the left is called a rimfire because the priming mixture is put on the inside of the brass case all around the base so that a firing pin strike anywhere on the rim can set it off. Although they can't be reloaded, rimfire cartridges are much less expensive to produce. They require extra caution in their handling to avoid knocking the rims. All cartridges need to be confined in a firearm's chamber to build up the pressure and direct the bullet out of the barrel. Contrary to popular belief, a loose cartridge will not generate as much power if it goes off for example in a fire. The brass case, being the lighter component, may fly fast enough to break the skin or put an eye out, but the heavy bullet won't generally do much damage. A loaded revolver in a house fire is another matter. Ammunition for defensive use has to be reliable. A click when you expect a bang can be as deadly as a bang when you expect a click. The centerfire is more reliable than the rimfire. When a rimfire refuses to go off after a square hit from the firing pin, follow all range and safety rules pointing the gun safely downrange and waiting 30 seconds before clearing the stoppage. Reliability also means that the ammunition feeds smoothly through the gun without a hitch. Clean, fresh ammunition is a must. Keep moisture, oil, and solvents away from carry loads, especially the primers. Primers are usually sealed at the factory, however, a tiny bit of Nail Polish or clear lacquer around the primer and case crimp will protect against inclement weather. New guns usually require a break in period which can afford an excellent opportunity to assure yourself of the reliability of the ammunition you will carry for self defense. Find out what the police in your area are using and why. When legal to use, hollow point bullets are designed to mushroom, expend their energy quickly, and they do a lot of damage without penetrating too much. The small calibers may require a full metal jacket just to penetrate far enough. For defense against big animals with teeth and claws, careful shot placement with a heavy, hard cast lead flat point is paramount for extreme penetration through tough hide, fat, grizzle, and heavy bone. A selection of the most common pistol cartridges arraigned in four groups of three. Based on the premise that a hit in the eye socket with a .22, if it fires, beats a hit in the toe with a 44 Mag, a lot of little guns in these calibers are purchased each year. The 25 ACP with its 50 grain full metal jacket and the 32 Auto with is 71 grain bullet promise small size, minimal recoil, and low noise. Ear protection and eye protection are still mandatory when shooting these short barrels. Except for the larger target .22's, these small guns aren't designed for accuracy. Usually an inexpensive weapon can mean questionable reliability. Some feel that a baseball bat might have more effect. But if the feeling of confidence and the purposeful stride these calibers bestow means that the bad guys will look elsewhere for an easier victim, your purpose has been well served. These are marginal defensive calibers utilized in some back up role by those who have chosen more effective weapons for primary carry. Recoil and muzzle bark can be managed without much practice, especially for the petite or physically challenged. The attraction for the 380 Auto is the recent production of miniature featherweight concealable autos. Since the 380 is loaded to very low pressures, it is less punishing on the ears when fired in confined spaces. The 9mm Luger, already a high pressure cartridge, is much better now with the availability of heavier 147 grain bullets. The 38 Special has some higher pressure loadings available that give it a big boost. Be careful not to run them through an older revolver. For the beginner, a simple to operate revolver of 38 Special, or of .357 Magnum loaded with 38 Special ammunition, may be the minimum recommended. Nevertheless, perceived recoil is just that, perceived. With the proper training and technique, many novice female students have quickly found the more powerful calibers very acceptable and even fun to shoot. Studies of shootings clearly indicate the superior performance of these calibers in stopping an assailant with one shot. It may be another example of Newton's Laws at work. It may be that the extra practice required to handle the perceived recoil and blast has paid dividends through good shot placement. The 357 Magnum cartridge is legal for deer hunting in Minnesota, and revolvers so chambered can also fire the 38 Special Cartridge as a light practice load, but not vice versa. The .22 makes a better light practice load, and dry firing the 357 while watching for steady sight alignment, with Snap Caps in the cylinder, is the better way to learn trigger control. Real practice should be done with loads that approximate the power of real defense carry loads. In recorded shooting incidents, the .357 Magnum loaded with 125 grain hollow points received the highest score for one shot stopping power. The 40 Smith and Wesson caliber has won over many police departments recently, and many fine autos are chambered for it. Its high pressure loadings in the heavier bullets come close to the performance of the old low pressure 45 Automatic Colt Pistol round. In general, a low pressure cartridge is more pleasant to fire in confined spaces. The 45 ACP has compiled an impressive record as an effective stopper, virtually tied with the .357, and it is loaded with the heaviest bullets in this group. Its perceived recoil isn't much more than the 40 S&W and its muzzle blast is comparable. The large size of this cartridge may contribute to reliable feeding and the most dependable and accurate production autos, the Kimbers, are almost exclusively chambered for the 45 today. In my opinion, a heavy bullet works better. High velocity is nice, and the 9mm has been shown to penetrate just as far as the 45. However, deflection is a problem with lighter bullets. See the posts of a medical examiner found on mouseguns.com. I feel that a heavy bullet will fare better when breaking down the heavy bones of the pelvic structure in order to stop an advancing threat. A bullet that reliably expands, but doesn't break up, has been the "holy grail" of defensive handgunners. Cor-Bon's DPX may be the answer. It uses the pure copper Barnes X pistol bullet at high pressure loadings, and test results can be seen at the bottom of this page. These powerful cartridges have gained their fame through the successes of handgun hunters taking every large game on both American continents. Typically, they use heavy, long barreled revolvers, and generate near rifle energy. One shot without ear protection is enough to cause permanent and progressive hearing impairment. More recently, short, light weight handguns in these calibers have become popular with hikers, backpackers, and fishermen in Alaska. These revolvers made from titanium and scandium are carried a lot but shot a little. The short barrels sacrifice velocity and power, but still have plenty left over with the heaviest hard cast bullets for protection against the unpredictable wildlife in the woods and mountains. The critical distance to survive an attack is greater when a large carnivore exhibits bursts of speed. It is important to develop the skills for effective shot placement at these distances, even if the short sight radius of the short barrel makes it a challenge. It's evident that the 357 Magnum can't deliver as heavy or as hard hitting a bullet as the 40's. 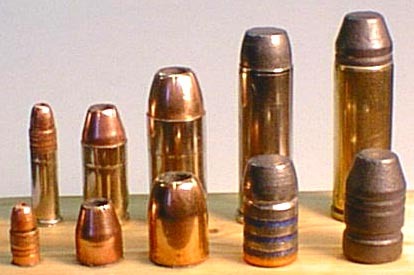 Five selected calibers and their specialized bullet weights in grains. Mouseguns is a resource for more information about ammunition and effectiveness. Be careful of squib, or weak, loads, because they may cause a catastrophic obstruction of the bore. Do Lead Bullets Continue To Be A Hazard After They Land? Loaded to +P velocities, the Barnes pure copper X bullet that Cor-Bon uses is a real performer. The last time we did a bullet performance test was during a course in PA early last year. At that time, friend and colleague, Mike Shovel from Cor-Bon brought out huge blocks of ballistic gelatin, and we shot them with a variety of commercially-available, high-performance pistol ammunition. We required each bullet to first penetrate four layers of denim before entering the gelatin. At that time, we discovered that denim retarded and frustrated the expansion of a number of conventional, hollow-point bullets. In bare gelatin, most expanded just fine, but the denim barrier presented a problem for all but a few. The combination of leather and denim frustrated most conventional, hollow-points. Most traversed the gelatin with badly-compromised expansion. Some did not expand at all. Even Cor-Bon's vaunted PowerBall (45ACP, out of my Detonics) did not do well in this test. I was surprised, as few rounds will out-expand PowerBall, but the layers of clothing, combined with the Detonics' short barrel, conspired to thwart performance. The one round that expanded consistently and completely, despite the leather and denim barrier, in all calibers, was Cor-Bon's DPX! DPX, in 40S&W, 45ACP, 357SIG, 38Super, and 45AutoRim, were all unimpressed by the leather and denim. Even 380Auto DPX, out of my little Kel-Tec, was immune. It expanded symmetrically and completely, penetrating nine inches of gelatin, after penetrating the clothing. I am more persuaded than ever that DPX provides superior performance in the widest spectrum of circumstances, consistently outperforming any other bullet of which I am aware. "John, we're fresh form attending a two-day AVOPS (Armed Vehicle Operations) course in IN. During the final afternoon we were able to conduct testing on the windshield of a 1991 Lincoln sedan. We had been advised that, when shooting from inside a vehicle out, or outside a vehicle in, the windshield will cause the bullet to deviate up to six inches from the point of aim. This general rule held true with every high-performance pistol round we tried. All but one, that is. Cor-Bon DPX stayed directly on target even after penetrating laminated, angled, windshield glass. There was NO deflection at all. There was also no disintegration of the bullet, as it passed through from either direction. Point of aim was point of impact, both ways! We have yet to find a downside to DPX!" Comment: DPX is a stellar performer in a wide spectrum of circumstances. "We tried choking DPX with everything we had available: drywall, multiple layers of fabric and leather, plywood, sheet steel, et al. DPX penetrated through-and-through and subsequently expanded symmetrically in gelatin on the other side in every case. Such intervening barriers invariably frustrated subsequent expansion with nearly all conventional, jacketed/lead, hollow-points. Then, we got a door from a wrecked, 2001 Dodge Dakota. At the upper edge,a double-layer of sheet steel is folded back on itself in order to create a rigid perimeter for both the inner and exterior panel. The effect is four layers of sheet steel, a formidable barrier indeed! George and I just shook our heads. The stuff really works!" "I can hardly put into words the events that occurred this afternoon in my life! I responded to a 'man-with-a gun' call. I was not in uniform, but one of our uniformed sergeants and I arrived on the scene about the same time. I was first to confront the suspect (not known to us before today). He was standing on a street corner. No gun was visible. However, the instant our marked car arrived, the suspect produced a pistol (brand/caliber unknown at this writing) and fired one round at the vehicle. He then immediately pivoted around and fired several rounds at me! Neither our sergeant nor I were hit. I drew my G23 from concealment and fired two shots (Cor-Bon 140gr DPX, issued by our department, starting in June of this year) at the suspect. Range was eight meters. My front sight was on his body midline. To my great relief, the offender abruptly dropped his pistol and straightaway collapsed where he had been standing. Additional shooting was unnecessary. He was DRT. Never took another breath! Evidence techs reported both of my rounds struck mid-chest, within three inches of each other. Both bullets expanded perfectly, caused massive internal damage, and came to rest just under the skin on the opposite side of the suspect's body. Neither bullet exited. I continue to live and breath this evening because of our department's excellent training, my G23, and your ammunition technology. I thank you, Glock and Cor-Bon. Our entire department thanks you!" Comment: Competent training, personal decisiveness, and superior technology combined to preserve this young officer's life. Oh, that it were universal! At a Course in PA this weekend, Mike Shovel from Cor-Bon was on hand, once more, with blocks of gelatin for ballistic testing. One final note: A student shooting a G29 (10mm) was interested in the performance of his carry-load, a "high-performance" conventional brass/lead hollow-point. It chronographed at only 970 f/s, and then failed to expand at all after plugging up with denim. The bullet subsequently penetrated twenty-six inches of gelatin and kept going! Profoundly poor performance from a round that I, and the shooter, thought would do much better. Not impressive! He consumed the balance of his inventory of the stuff in training, getting rid of it all. At an Urban Rifle Course last weekend in PA, my friend and colleague, Mike Shovel from Cor-Bon, was, once again, on hand to host one of his now-famous Gelatin Tests. Mike invited all my students to shoot the FBI Gelatin Routine, which he had set up on the pistol range, with whatever load they carried in their rifles and pistols. I carry DPX (5.56mm) in my NGA/X7, in my Gen4 G23, my Kahr PM45 and P380, and my S&W Scandium Snubby. So, I shot it all into Gelatin. We also shot Vicki's M1 Carbine w/100 gr DPX. Out of my 16" X7, 62gr DPX does 2800 f/s, plus change. Out of the M1 Carbine, DPX does just over 2000 f/s. Even when having to first penetrate four layers of denim, all DPX rounds expanded normally and subsequently penetrated between ten and fourteen inches of gelatin. Out of my Gen4 G23, 135gr DPX (40S&W) clocks at just under 1200 f/s. It would be hard to imagine a better defensive handgun load! All other conventional brass/lead pistol hollow-points expanded to some degree, but expansion was often minimal, frustrated by the layers of denim. Into bare gelatin, they do much better- the so-called "nudist-colony test." 5.56 Federal Tactical performed nearly as well as DPX. It was obvious to all that DPX is hard to beat. No conventional hollow-point pistol bullet does as well over such a wide spectrum of conditions. 10. You know what poison ivy looks like…BUMPS. 9. You think side by side shotgun means one in each hand. 8. You sprinkle trail mix on deer runs. 7. Your experience with a lever action is in the casino. 6. You carry aspirin for buck fever. 5. You think an auto loader is a beer keg. 4. You get your limit before the bar closes. 3. Your dog won’t hunt. 2. You carry so much gear your compass always points at you. 1. It’s the only chance you get to see a nice rack.